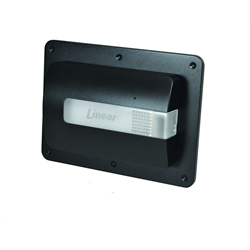 The Linear GD00Z is a Zwave enabled garage door sensor and opener for use with Zwave automation control systems. The tilt sensor is installed on your garage door, allowing the system to know and report the open/close status to your automation system. The GD00Z connects to the garage door opener via 2 wires, to open and close the door when requested by your automation system. In order to meet industry standard safety requirements, the unit will provide a visual and audio warning before closing the door. Note: GD00Z-4 and GD00Z-5 are interchangeable. We will ship whichever is currently available. The GD00Z opens and closes your garage door by simulating button press of the garage door button inside your garage. You can test compatibility with your garage door opener by using a short piece of wire to momentarily bridge the two garage door button terminals. If this opens, stops, and closes your garage door, then this kit is compatible. If still in doubt or you are not comfortable testing this method, please contact Linear to confirm prior to purchase.